I've recently written about my use of Anglican prayer beads. Well, I like them so much I've taken this to a whole new level. Over the Christmas season I gave prayer beads as gifts to family members and some others at church. This made me want to give out more beads. But that is cost prohibitive. So that's my new hobby. Making prayer beads for people. I use good materials--beading wire, glass beads--but each set is only about $2.00 in materials. So I can make lots and give them all away. Beard, tattoo and now beads? What a shame you missed the sixties! They don't have any intrinsic significance. They are a tool. A knotted piece of rope would do (and many use just that). What I like about them, as someone who struggles with prayer, is how they help me use structured prayer. Given my doubts about prayer I need something structured and ritualistic. (I'm one of those "religious but not spiritual" types.) Moving from bead to bead carries you forward with words you've already decided on and you come to an ending point. Plus, there is something....um....Incarnational (?) about the physical aspect of them. That's the part that surprised me. How I simply like to hold them. Prayer becomes as physical as much as mental. And finally, simply having them in you pocket functions as a reminder to be prayerful and/or more mindful. Yeah, I'm a bit out of control. I've been told this a lot. 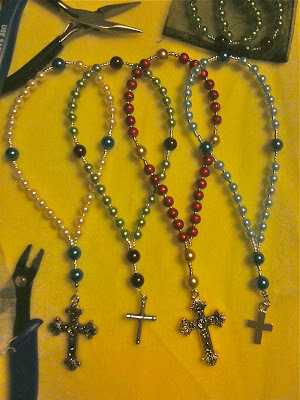 Fabulous prayer beads. Unfortunately, I am rather inept at craftiness and all the detail. Would any bead store carry the essentials to create what I see in your picture? Yes. The only tools you need, in using beading wire, are flat nose pliers (and you might have some of those already), a wire cutter, and a crimper. But if you use filament you don't need any of that. Just scissors. These are great, Richard. I ordered my beads all the way from Jerusalem after your last post - not because they were imbued with a special aura of holiness so much as the fact they were the cheapest (and least garish) on Amazon. I'd love to hear more of your experience of using these beads - and the stories of other readers, too. They have brought a completely new dimension to my own prayer life, such as it is. I often use them while driving or riding my bike to work. That is some built-in "alone time" where the beads can be used. Plus, it helps settle the spirit before walking in the door at work. I also pull them out when feeling stressed, angered or agitated. I'll leave the office and take a quick walk, pulling out the beads. A great example of this was shopping during Christmas. One Saturday before Christmas I found myself Christmas shopping at the mall. Absolute hell. No parking. Crushed with people. Ill-tempers everywhere. My mood started to turn dark. So I pulled out the beads and started in (I use the Jesus Prayer mainly, "Lord Jesus Christ, Son of God, have mercy on me, a sinner.") and my spirits brightened. I became the happiest most peaceful shopper in that consumeristic maelstrom. Those are beautiful. It reminds me to say that, if one isn't a Christian, you can use something else other than a cross for the charm. Something that helps you become more mindful and is significant to you. I made one for Jana with a bird charm and she's also having me make one with a tree charm. "Richard, almost thou persuadest me to become a Catholic?" Found myself smiling and feeling all happy and light as I read this post. I must have missed your last one about prayer beads but I went back and read it just now. A spiritual practice that begins with a trip to the craft store. I love that. A spiritual practice grounded in the body and the senses and with a healthy dose of creativity thrown in at the very beginning. I so want to do this. Don't tell my mother, though. I was raised to pity the poor unenlightened Catholics who were enslaved to such things. Who knew? You go, sir! Arts & crafts are good for the soul. Oh, I was totally dominating Hobby Lobby. Don't let em get you down, though. Where do you buy your beads? I've made a few sets of prayer beads over the last couple of years, but shy away because they have always been so pricey. Perhaps I'm shopping for beads in the wrong places! Well, I just went to Hobby Lobby and found stands of inexpensive glass beads for $1.99 for 60 6mm or 8mm beads. A strand of each--one of 6mm and one of 8mm--is enough beads to may two strands of Anglican prayer beads (though you still need seed beads and crimping beads, but a package of like 200 seed beads was, I think, $2.99). I was able to buy two cross charms for $1.49. Very nice. I have a rosary that kind of looks similar but I've never actually used it for praying. There's holiness in a creative act: as Dorothy Sayers says, "In the beginning, God created." And the repetition is calming. . . except when you screw up for the umpteenth time and have to supress the urge to cuss and fling the beads against the wall. But I guess that's an exercise in patience. I frequently use bronze reproduction crosses from gardensofgrace.net--they have some very beautiful medals as well--and instead of wire links I use beading cord and put a barrel knot between each bead. Convinced me to get one. Was looking to find a good tool to help with prayer and meditation and mindfulness. Uh . . . when do I get mine? Regarding your previous post on prayer beads, I went out the next day to Hobby Lobby and made some for me and my wife. I found some more prayers online (My favorite and most-used prayer being a Celtic prayer by Sister Brigit-Carol.) and worked through them while I was tying on each bead. It probably made for an interesting sight as I put them together on the veranda at Starbucks. I have really enjoyed having them and they definitely provide focus for my times of prayer. Thanks and keep it up!